The Ambassador of the Lao PDR to India, Southam Sakonhninhom, his spouse and Lao Embassy staff recently attended the 212th King Sarbananda Shingo Cultural Festival at Dibrugarh district, Assam State, upon the invitation of the Association of Tai Khao people or Matak (All Assam Matak Sanmilan). 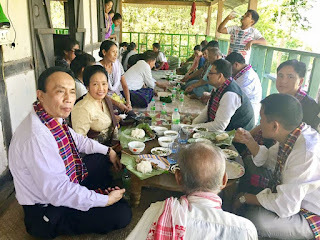 While in the area they visited a village inhabited by the Lao Leu ethnic group (Phakey) at Bor Fakial, Tinsukia city, Assam State, according to Malayvieng Sakonhninhom, spouse of Lao Ambassador to India. She said that the Bor Fakial village was located 45 km from the city. The kinship visit was assisted by Anup Chetia, Chair of the Festival organising committee and his family with the effective coordination of Dr Ashwin Kumar Mahanta. This visit was suggested by former Deputy Prime Minister and Minister of Foreign Affairs Thongloun Sisoulith in 2014 prior to his elevation to his current role as the Prime Minister of the Lao PDR. Thongloun asked Ambassador Southam Sakonhninhom to make an attempt to visit Lao kinsfolk who moved to Assam State hundreds of years ago. It is believed the Lao Leu Phakey settled on the river bank at Dihing, Bor Fakial village, Tinsukia city, Assam State some 350 years ago. It was the first meeting with Lao Leu Phakey, though a previous visit was also made to the Lao Ahom of Assam State. Malayvieng said that this time, members of the Lao Leu Phakey community gathered at the temple where both sides exchanged views and had lunch. All agreed it was an emotional, exciting, and fulfilling opportunity to witness the Lao descendants gathering. Embassy officials were impressed with the community’s efforts to maintain tradition, language, hospitality, and culture, especially their Lao food. Their language may have evolved with the influences of their surroundings but much vocabulary remains similar to the Lao language, for example when describing body parts. “They welcomed us with Asami tradition like offering Assam style scarf to men and a Lao Leu style skirt to the Ambassador’s spouse,” she said. They also offered a Lao-style lunch of sticky rice, fish and bamboo shoot soup (kaeng nor maisom), fermented bamboo shoot sauce (Jeo nor maisom), banana trunk soup (Kaengyuakkuay), chili sauce (jeomakphet), vegetable salad (Soup phuk), pork barbeque (ping mu) and spicy piglet salad (jeo mu noi). For snacks and sweets, they offered sticky rice cakes with banana (khao tom kuay), fried sticky rice (khao niewjeun), fruit and tea. “We had an intimate lunch and conversation like kin who had not seen each other for a long time. Some of us could not restrain our tears,” Ms Malayvieng said. “From our observation, we learned that lifestyle for them is still difficult as they live 45 km away from the city,” Ms Malayvieng said. Like any Lao community in general, they always have a temple close by wherever they settle. Currently the Lao Leu Phakey community is building a new temple to replace the old one dating back 200 years since the time the area was under British colonial rule. Before departing, the Lao Leu especially the older generations expressed their interest in visiting Laos. They also expressed a wish that Lao people in Laos come to visit them. The Lao Embassy in India expressed gratitude and appreciation to the Matak Tai Khao community (All Assam Matak Sanmilan) and Anup Chetia as well as a very great thanks to Dr Ashwin Kuman Mahanta, the coordinator and principal driving force behind the success of the historic occasion.